Packing for a holiday can be quite the task and when you think about staying fit while traveling, it becomes even more intimidating, but it doesn't have to be. Thanks to the athleisure craze, workout clothing is not only trendy when it comes to street style, but it's so much more chic than it used to be. So many fitness brands are making pieces that are just as appropriate to wear out in public as they are functional for your sweat sesh. 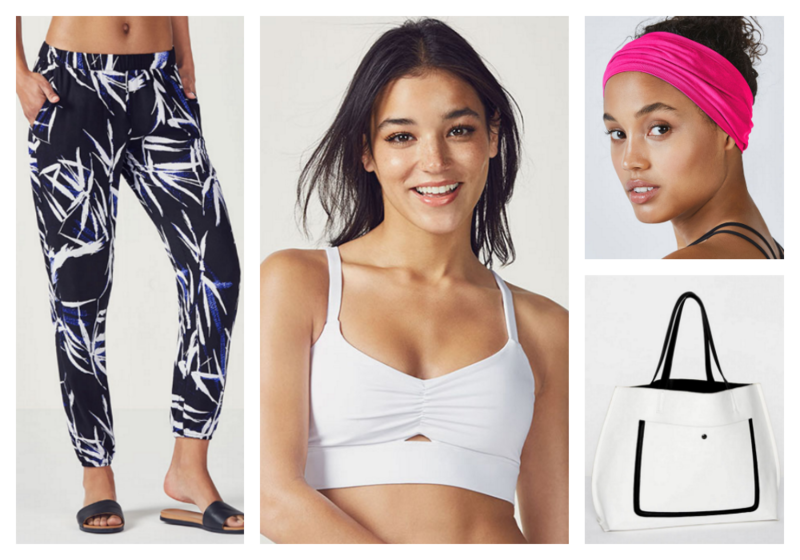 Fabletics, the fit fashion brand co-founded by Kate Hudson is one of the brands that's nailing stylish fitness gear at affordable prices. 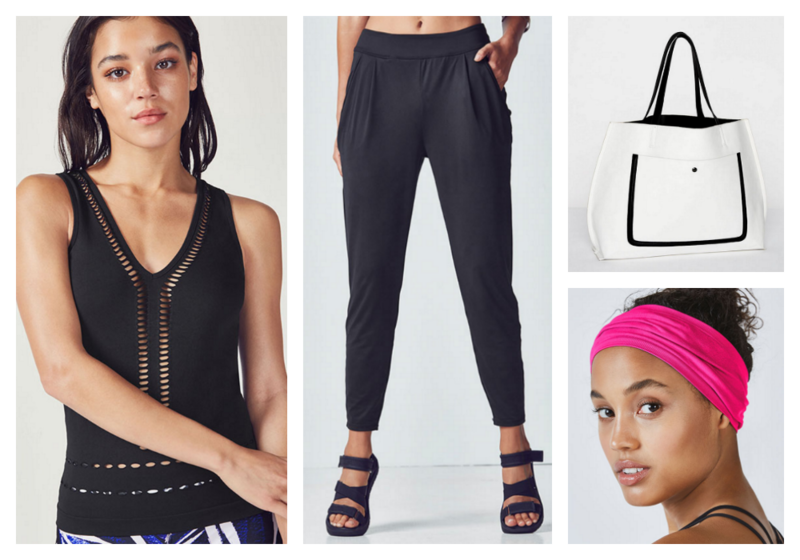 This week, Pink Julep is teaming up with Fabletics to show you how easy it is to create a stylish activewear capsule collection that you can mix & match for workouts on the go as well as social activities while you're traveling without too much hassle. 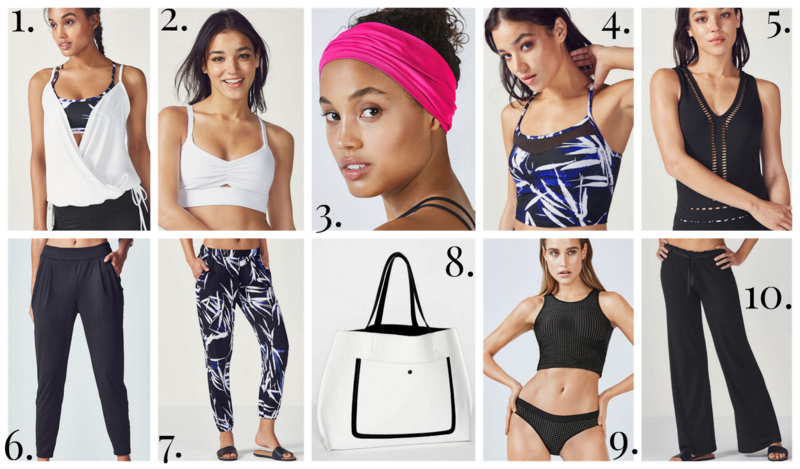 Using only the 10 pieces pictured above, I'm going to show you how you can mix & match to make sassy outfits for any type of workout that look just as good when you wear them for brunch or drinks while you're jet setting this summer. These pieces will be wonderful additions to your gym kit when you return home too and they're so versatile you'll probably be able to mix & match them with other pieces you already have in your fitness wardrobe. The Swim Collection is new to Fabletics and it's so chic, yet the styles are perfectly functional for actually swimming. If you're a fit girl, it's frustrating to think you have to sacrifice style to find a suit that will handle a good water workout. With Fabletics, this simply isn't the case. Whether you're planning an intense sea swim session or simply looking to hit the beach in style, I love the Heide Bikini and here I've paired it with the Jennifer Pant, the Seamless Headband and most importantly, the Avenue Tote, which features quite heavily in this post because it's a super chic bag that can be used for the gym, the beach, poolside cocktails or pretty much anywhere you're planning to go. It makes a cute carry-on as well while you're traveling, so you really get a lot of use out of this one bag that will go with everything. I'd wear the headband with my hair down like Brigitte Bardot and add chic black sunnies with a pair of gold statement earrings to this look for a fierce seaside statement. Packing Tip: Stash a chic & simple black clutch inside your Avenue Tote and pack your jewellery or other small accessories in it. You will save space and then you can use the clutch for evenings or on days when you don't want to carry a big bag around with you. Maybe you're planning to work out while you're on holiday and maybe when you get there it doesn't go according to plan. 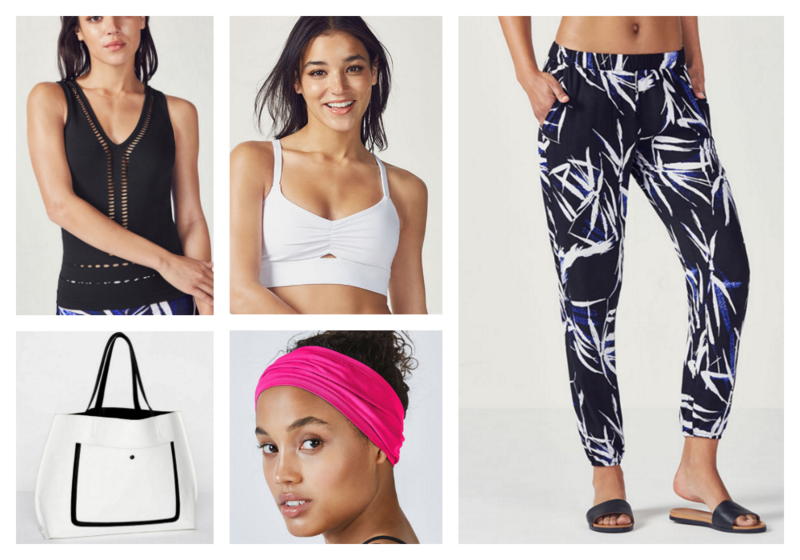 Either way you'll look trendy and chic with these pretty picks from Fabletics. The Kathleen Seamless Tank is so chic that you can wear it anywhere. I wouldn't think twice about putting this on with a slick pair of trousers or a fabulous skirt, but I also love the idea of layering it over the Kenzie Sports Bra in white for a contrast look. 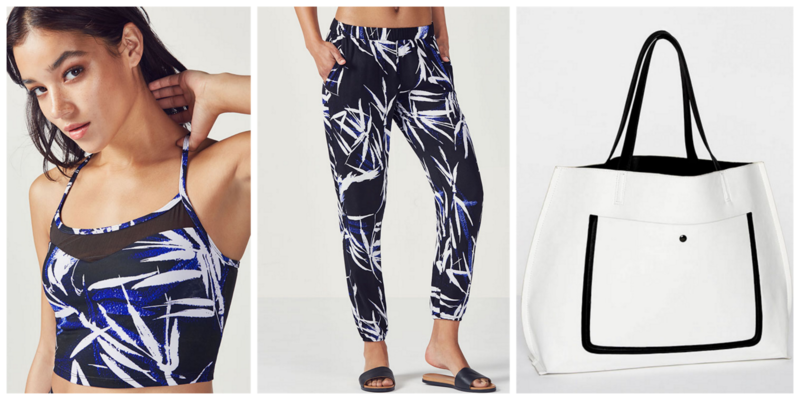 Paired with the La Palma Print Emily Joggers and the white Avenue Tote, this is Athleisure chic at its finest. Sandals would work well with this look, but it could easily work with a pair of plimsoles or cute trainers too. For this look, I'd keep the jewellery minimal, but I might add a fun pair of sunglasses. 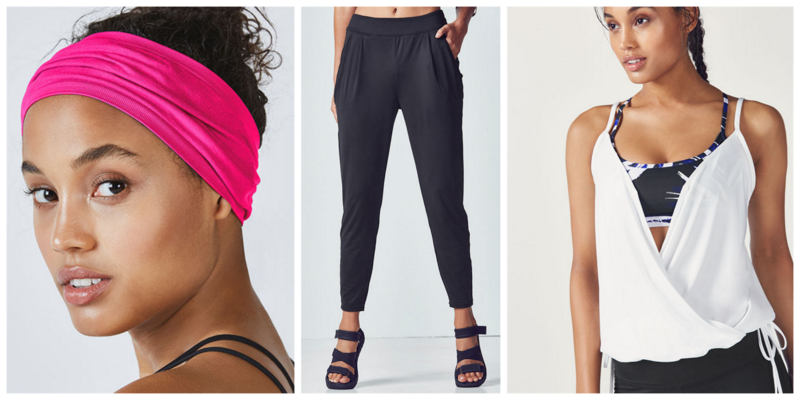 The pink Seamless Headband adds a pop of complementary, but contrasting colour and it's totally optional here, but might be a lifesaver if you've got salt water beach hair or if you're like me and can't bother to do your hair while enjoying a relaxing holiday. 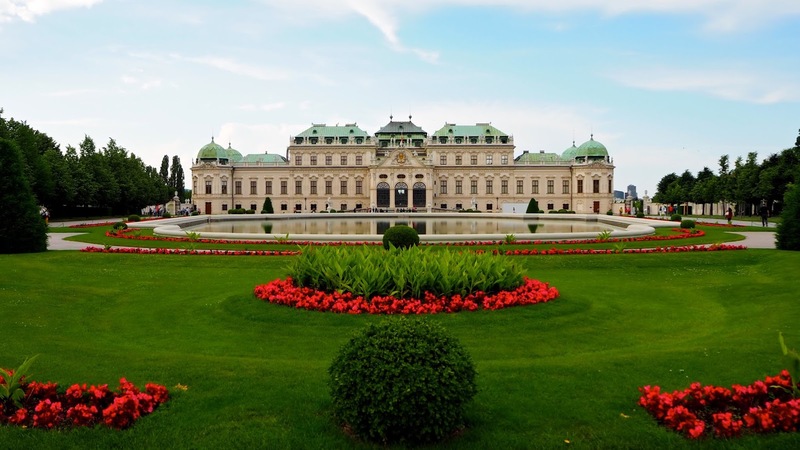 Keep an eye out for some packing tips below too to make your upcoming trips that much easier! I love cycling while I'm on holiday - it's a great way to get around and see the sights at the same time while staying active. Whether you're renting bikes in Amsterdam, cruising along the Cornish Coast or taking a spin class at a chic resort in the Mediterranean, you'll be more motivated to get moving if you have the right ensemble. 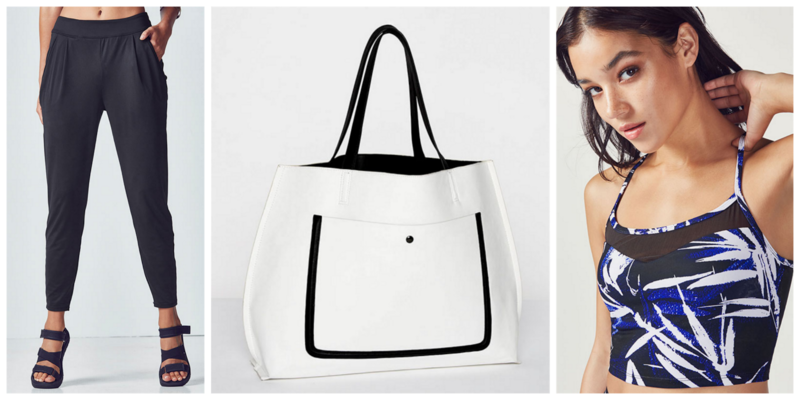 Stash a water bottle, your phone, a map, a snack and a towel into the Avenue Tote. Put on the Marcella Mesh Midi Bra & Emily Joggers in matching La Palma Print with your favourite pair of trainers and get excited for the ride! Packing Tip: Plan how you'll keep your workout gear clean between wears so you can rotate pieces more than once. If you don't want to shell out for hotel laundry bills, pack a small bottle of Woolite or other gentle laundry detergent and hand wash pieces as you wear them, hanging them up in the bathroom to dry before you go out for the day. Whether before or after your workout or you simply can't be bothered while you're on holiday to wear anything restraining for your bottomless feast, this look is perfect for a brunch date. A sleek black top with chic black tapered joggers is super trendy right now. Pair this look with the pink headband, a black & white tote and your favourite pair of sandals for the perfect weekend casual look. Don't forget a pair of oversized sunnies. If you're popping out to the hotel gym or heading outside for a HIIT session in the sun, you'll want to be comfy and look fierce. If you're brave enough to skip the layers, I love the Kenzie Sports Bra and it looks fierce with the La Palma Print Emily Joggers. 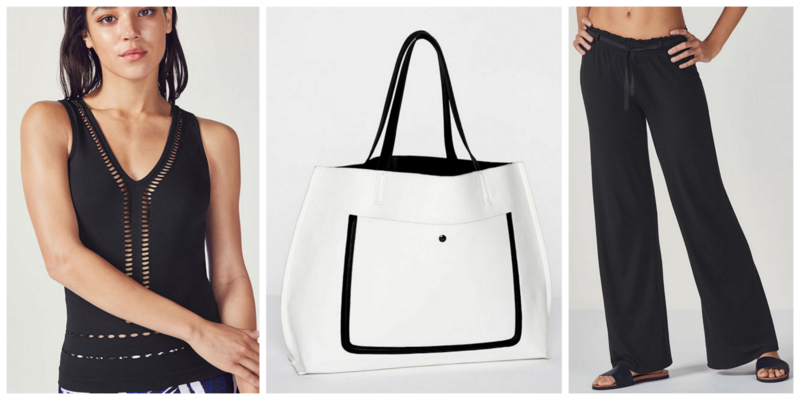 Again, just grab the Avenue Tote as your gym bag and you're all set. Packing Tip: If you need to save space in your suitcase, don't pack socks. You can buy some cheap ones when you get there at a store like H&M or Primark and then just leave them behind when you head home. When I'm on holiday, I always try to get some chill time... A bit of time when I don't want to do anything or really go anywhere is key to recharging my batteries. I like to enjoy a book on the balcony, find a good movie on TV or just chill out in the garden with a cup of coffee and some peace. This is the time to just relax and be comfortable... Pop on the Marcella Mesh Midi Bra, the Artemis Pant and if you absolutely must go anywhere, throw your favourite beach read and headphones into the Avenue Tote. Instant relaxation and you'll look good while you do it! If you're someone who loves to run even while on holidays, keep your packing light by using the Artemis Pant for your run as well. The Seamless Headband will keep the sweat and hair out of your face and the Elaine 2-in-1 Tank is perfect for travel because the sports bra is built-in so you only have to pack one piece instead of two. Packing Tip: If you're concerned your clothes will wrinkle in-transit, try rolling them instead of folding as you pack. When you arrive at your destination, unpack right away and hang up anything that might wrinkle. Hang pieces that are already wrinkled in the bathroom so they can steam whenever the shower is running or use an electric tea kettle to steam out any small wrinkles. Switch up the look of the Heide Bikini by adding the Artemis Pant. This is the opportunity to go crazy with your accessories with that Instagram-worthy beach hat you've packed or a pair of wild and crazy tassel earrings. 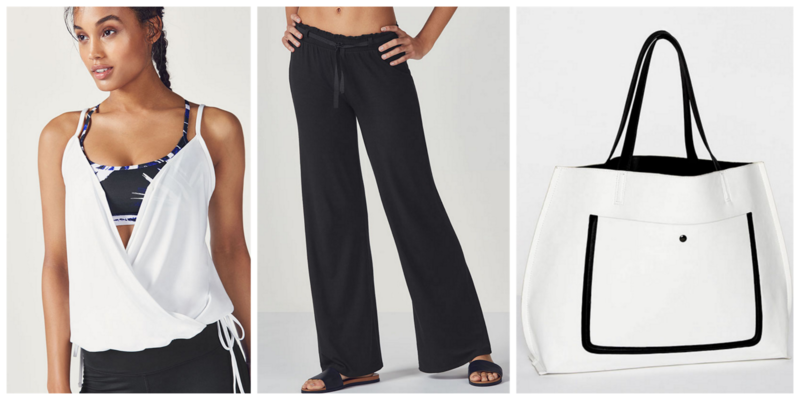 Of course if you're more of a minimal gal, you'll be just as chic sticking to classic black & white! While these pieces are great for working out or getting active on holiday, they're just as chic for a day of sightseeing and you'll be super comfy. Perhaps bring a cardigan or wrap if you get chilly easily or need to cover up for any reason and enjoy being comfortable while you explore a new city. Packing Tip: If you're checking luggage, be sure to pack liquids such as sunscreen, shampoo & conditioner in plastic zip lock bags before you put them into your checked bag to prevent any leaks from soiling your clean clothes. I usually love a good long walk or hike while I'm travelling, but I sometimes find it's difficult to look chic and be comfortable for such adventures. You never know where your walk will take you or what kind of adventures await, so you want to be dressed for anything. I'd probably wear these pieces together with a pair of sleek black trainers for walking and slip a pair of sassy flats or sandals into my bag for unexpected discoveries where I want to look a bit more put-together. I might also pack a cute black cardigan in case I get a bit chilly and I'd accessorize this look simply with a pair of silver hoop or dangle earrings. Job done. Fabletics is a unique fitness fashion brand co-founded by Kate Hudson with a membership option that releases new styles every month. The Fabletics experience starts with a quick quiz that helps the brand identify your fitness style & requirements with questions about the types of workouts you enjoy, your size, your style preferences, etc. This information simply helps them to make appropriate recommendations for you each month. You can either shop as a guest or become a VIP member which offers perks, a points program that lets you earn points towards free loyalty items and discounts of up to 50% off regular prices. As a member, each month before a specified date you can choose to either shop or skip the month. If you do neither, your credit card will be charged £44 every month unless you cancel, which you can do at any time. That charge becomes a credit on your account which you can use towards a purchase at a later date of your choice, so it's a win/win even if you forget to shop or skip the month. For more information or to get started, visit fabletics.co.uk.